It’s that time of year again!! The Ribble Group will be judging Christmas lights! 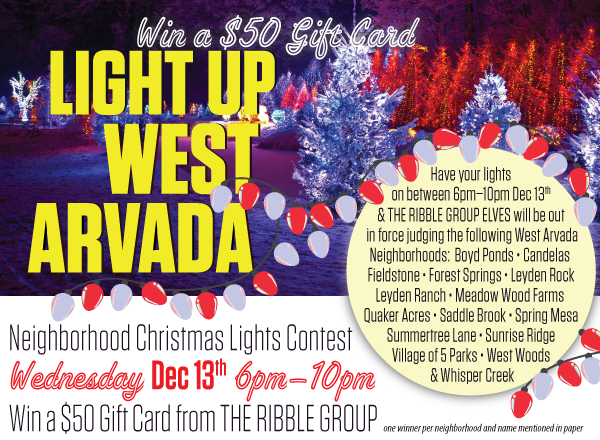 Have your lights on between 6-10pm December 13th and The Ribble Group Elves will be out in force judging the following West Arvada Neighborhoods: Boyd Ponds, Candelas, Fieldstone, Forest Springs, Leyden Rock, Leyden Ranch, Meadow Wood Farms, Quaker Acres, Saddle Brook, Spring Mesa, Summertree Lane, Sunrise Ridge, Village of Five Parks, West Woods and Whisper Creek. One winner per neighborhood will receive a $50 gift card from The Ribble Group. Good Luck!